Network Status Report: With Its Past Hits Fading, Can ABC Rebound With New Soapy Ones? 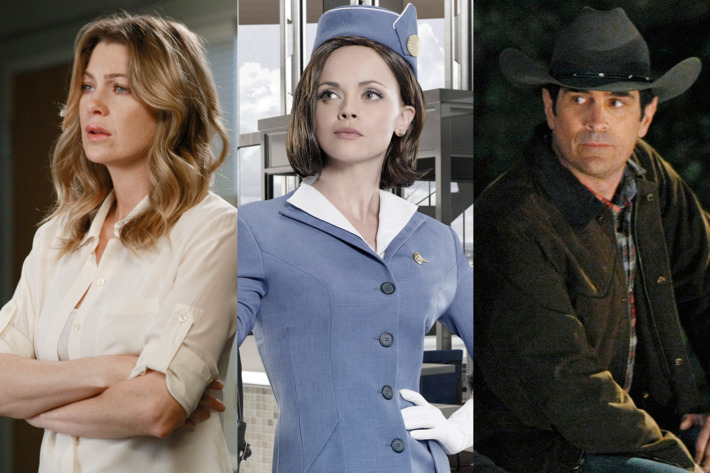 All week long we’ve been analyzing the broadcast networks’ prospects as they head into the new season, and today we end the series with ABC: It just barely hung onto third place last year, and with its once-hit series aging (Desperate Housewives, Grey’s Anatomy), the alphabet network is in dire need of new hits. Can the much-hyped Revenge and Pan Am restore it to the glory of last decade? Preseason standing: A weak No. 3, in both viewers and adults 18 to 49. This is partially because ABC doesn’t have the NFL to boost its Sunday ratings, unlike all of its main rivals, but it also had no new big hits. 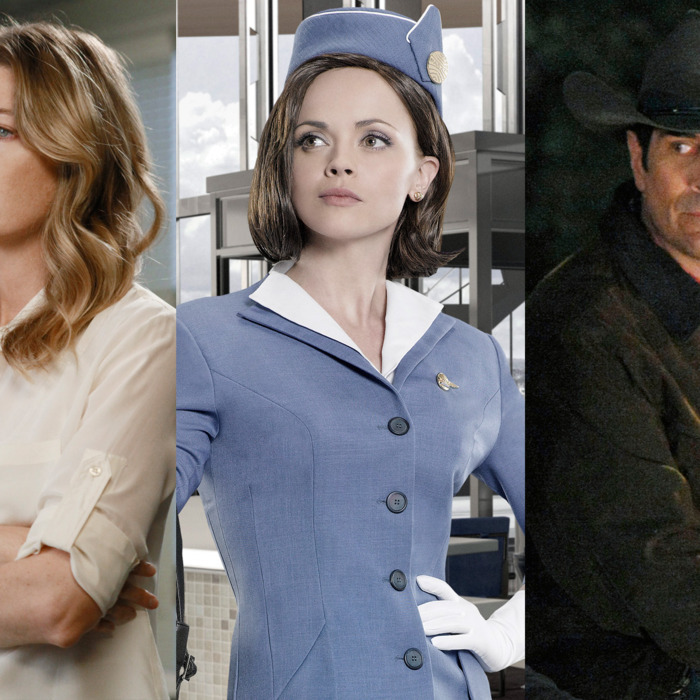 Lost is gone, Desperate Housewives will end this season (after a bad one last year), and Grey’s Anatomy has fallen far from its glory days, though it still pulls in very solid Nielsen numbers. Thankfully, Modern Family and The Middle both grew in their second seasons, turning into even bigger hits. And while Body of Proof is no game-changer, it showed signs of life (which may be one reason CBS is hoping to kill the show in its cradle by scheduling its hot new rookie Unforgettable directly opposite Body this season). Primary goal: Lather up the next juicy ABC soap. The Alphabet roared to life in the aughts with high-concept dramas super-popular with female audiences and acceptable to male viewers. Since those heavyweights have faded, ABC needs to find shows with similar pop-culture buzz. From the fall’s Pan Am and Revenge to mid-season entrant GCB, look for shows boasting lots of intense stares, melodramatic music, and cliff-hanger endings all season long. Most promising new show: ABC officials have called Revenge an internal favorite, something reflected by tons of on- and off-air promotion this summer. The show does stand a shot at finding an audience against crime dramas on NBC and CBS, but it’s the Alphabet’s Sunday newcomer Pan Am that really seems poised for takeoff. Some have dismissed it for being a watered-down clone of Mad Men set in the air, but that’s just silly.Pan Am’s true spiritual predecessor is The Love Boat, and we mean that in a good way. While not nearly as comic as Love, both shows use travel as a tool to help introduce ever-changing story lines and guest stars. Throw in some solid writing and great visuals, and ABC may have found the perfect show for viewers looking to turn off their brains and chill in the final hours before the work week begins again. Veterans on the bubble: ABC didn’t put Cougar Town on its fall lineup, which is reason enough for us to worry about the show’s fate long term. Shark Tank just barely earned another season, so its life span may also be limited. How it’ll finish: ABC ended last season just two tenths of a ratings point ahead of NBC in adults 18 to 49, with the race getting tighter once The Voice debuted. This year, NBC will have many more hours of The Voice and the Super Bowl. Unless ABC launches a couple of big hits this season, it could very easily fall into fourth place among both adults and viewers. Previous: Can The Voice Help Get NBC Out of the Basement This Year? With Gossip Girl Aging, Can Sarah Michelle Gellar Save the CW? Can New Dramas Keep CBS Strong As Its Hit Procedurals Age? Will Simon Cowell and Terra Nova Make Fox Even More Dominant, or Push Their Luck?